The nightshade family, Solanaceae, includes the potato, tomato, eggplant and pepper as well as tobacco and a number of flowering plants grown for medicinal or other value. I have been thinking about the pepper and its value to our diet and menu. Perhaps under-appreciated, this food, according to nutritiondata.self.com, is not surprisingly low in saturated fat, cholesterol and sodium. What may be of more interest is that a half cup of a green pepper provides over 300 percent of your daily recommended vitamin C, and is a good source of thiamin, niacin, folate, magnesium and copper, and a very good source of dietary fiber, vitamin A, vitamin K, vitamin B6, potassium and manganese. Not to knock the over the counter multi-vitamin, but a rich and varied diet of vegetables of many colors provides the diversity of vitamins and minerals that we both crave and need for good health. For those of you growing peppers, whether “sweet” green/yellow/red or of the hot variety (from mild to really hot), when the peppers start to produce, they really produce. This time of year, the whole nightshade family is in strong production, particularly when we have hot days and prolonged dry periods between rain. When you either grow your own and have a surfeit, or are trying to buy more at the market to support your health, what do you do with all these peppers? A good sweet (bell or banana) pepper is lovely just cut into strips and eaten plain, with dip, or on a salad. Recipes for stuffed peppers are bountiful, with or without meat. One of my favorites includes a filling of corn, black beans, onions, and spices. I found another recently for mushroom and wild rice stuffed peppers, and “stuffed pepper soup” can be made fresh or made from left over stuffed peppers. There is hot pepper jelly, pepper steak (easily adapted for the slow cooker), and (my personal favorite) a type of “fajita” with peppers of any color and both sweet and hot, cut into strips with equal amounts of onion strips and quick fried with cumin; this can be used with beans or meat to fill corn or flour tortillas. Salsa, sour cream or crema, radish and tomato slices, and cheese may be added to your hearts content. 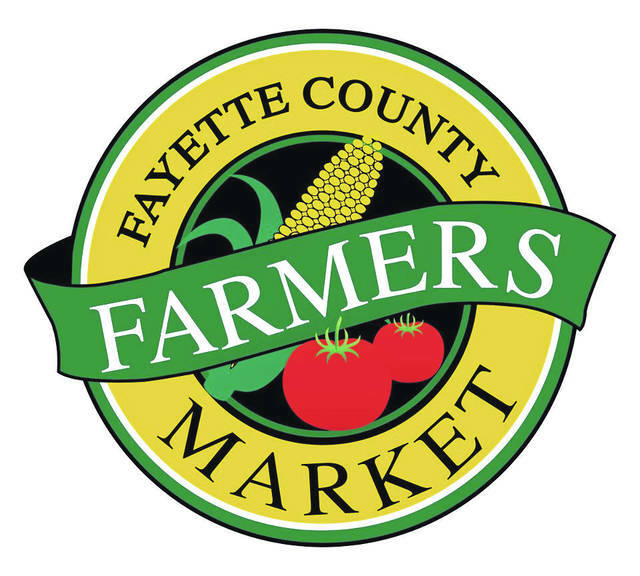 This meal is easy to make ever after a long day at work or hours spent visiting the Fayette County Farmers’ Market! Greens & Greenery (Katrina Bush): Seasonal, chemical free produce: Heirloom tomatoes, garlic, green beans, white and yellow potatoes, hot and sweet peppers, tomatillos Dried herbs (basil, sage, catnip, sacred basil herbal tea). Buckeyes, baklava, fudge, seasoned pretzels. Cut flowers. Jones Farm Fresh Produce (Jon & Taylor Jones): Green beans, red and blue potatoes, onions, squash, tomatoes, peppers, garlic, chicken patties, chicken breast, wings, chorizo chicken brats, pork chops, maple links, sweet Italian and jalapeño brats, ground pork, sausage patties, bulk sausage, hamburger patties, ground hamburger and brown eggs. King Farms (Jeff & Sandi King): Green beans, sweet corn, vine ripe tomatoes, cherry tomatoes, cucumbers, squash, new potatoes, homemade fruit pies, iced sugar cookies. Persinger Cottage Foods (David Persinger and Julie Mosny): Jam Man will have jams, jellies and peach butter. The Pie Lady will have pecan sticky buns, buns bars, cinnamon rolls, cinni-mini’s and local honey, as well as pies: blackberry, black raspberry, apple, strawberry. Chilcote Farm (Bruce & Marlene Chilcote): Honey, chocolate and white sheet cakes, butter pecan cake, hickory nut cake and probably yellow sweet corn. DeBruin Family Farm (Grant & Toni DeBruin): Organic produce including blackberries, peppers and tomatoes. Organic butter. Wildflower cards, gourds and chocolate chip cookies. Forgotten Way Organic Farm (Cathy Ludi): Therapeutic grade essential oils, wooden signs, homemade soap, vanilla, balms, dry shampoos, and foot soaks. Organic free range eggs. Offering a class and Q&A at 9:30 a.m., “Natural healthcare for Everyone.” Come join me in this brief introductory class and learn all about essential oils, how you can use them to support yourself and your family naturally, experience the amazing aroma, ask as many questions as you like, and learn why dōTERRA’s oils are the only oils you will ever want to use on your family. Our health is our responsibility, time to get empowered and take it back into our hands. Gerhardts (Kevin Gerhardt): white super sweet corn, watermelon, cantaloupe, crenshaw melon, bell peppers, sweet banana peppers, hot banana peppers, jalapeño peppers, cucumbers, and true field ripened tomatoes.